Chris qualified from Cambridge University in 1995. 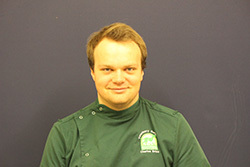 Chris began working at Brookfield in 2004, became a partner in 2005 and now co-owns the practice with his wife Victoria. 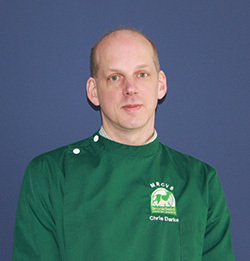 Chris is an Advanced General Practitioner with a Certificate in Diagnostic Imaging which includes ultrasonography & radiology (x-rays). He also offers in depth consultations for dermatology and canine behaviour. Chris spends a lot of time managing the day to day running of the practice. You may also spot Chris running when he’s out training for a marathon or two ! 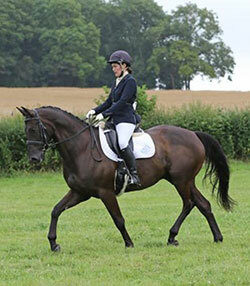 Victoria is Herefordshire born & bred and qualified from Royal Veterinary College London in 1996. 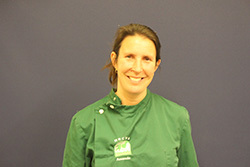 Victoria began working at Brookfield in 2004 and now co-owns the practice with her husband Chris. Victoria enjoys surgery. She also has a particular interest in veterinary dentistry. In 2015 she introduced digital dental radiography and has taken our dental care to new heights. As well as four sons at home, Chris and Victoria have two ginger cats; Geri & Hugo plus two labradors Derek & Woody that they individually rescued in 2013. Amanda qualified from Cambridge University in 2004. Amanda has been working at Brookfield since 2007. 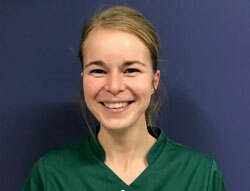 Amanda developed her interest and knowledge in poultry medicine and in 2017 trained to be able to perform veterinary acupuncture. Amanda has 3 dogs (Bobbins, Pip & Trevor), 1 cat (Rodney) and some chickens. Clare started working at Brookfield in July 2015. 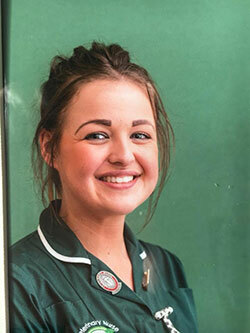 Clare qualified from Nottingham University in 2012 and has recently been working in South Wales. She loves meeting new people and their animals, enjoying medicine and surgery in equal measure. Clare has developed our laparoscopic surgical provision and is always keen to explain about procedures such as laparoscopic speying. When she is not at work she likes to keep fit by running and spends the rest of her time riding her horse with her dog Eric. Charles has been working with Brookfield Vets since he qualified, starting with us in August 2016. Charles now shares his time between both our branches, tending to spend one day a week in Ledbury and the rest of his time in Hereford. In his time off Charles enjoys renovating his first home in the centre of Hereford, and walks with Dora, his Norfolk love! Louise worked at Brookfield for nearly 4 years, she then moved away and had a daughter. 2017 she moved back to Hereford, and then started back at Brookfield. 2019 started with adding a son to their family -we look forward to welcoming Louise back after her maternity leave. Kelly started in January 2018 and is with us two days a week. She graduated from Liverpool university in 2010, and has worked in Herefordshire ever since. She holds a certificate in internal medicine which she completed in 2015. When she is not at work she enjoys being out and about in the countryside with her daughter and dogs (Rupert and Bear). She also has Neville the cat who was a stray that turned up at work 7 years ago. 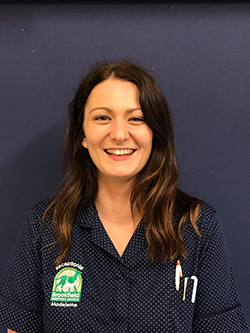 Madeleine has been with us during 2018 as a locum. She has a certificate on feline medicine and also is able to perform acupuncture on dogs and cats . Lucy was an experienced receptionist who always had a smile on her face. 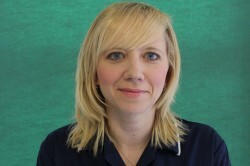 We were very pleased to be able to appoint her as Practice Manager in 2016. She has contributed to many of Brookfield’s achievements, including becoming a Cat Friendly Practice and setting up a branch in Ledbury. This year she completed a qualification in Leadership and Management. Lucy has a soft spot for cats which sees her having two of her own – Esme and Phoebe. Lucy obtained Phoebe when she was brought into Brookfield as a stray kitten involved in an RTA, she made a full recovery and now rules the roost. I started working for Brookfield in 2010 and started my Veterinary Nurse training while going to Abbeydale Vetlink College one day a week, I qualified as a Registered Veterinary Nurse in 2013 and since then have had a keen interest in emergency nursing and critical care, I was awarded my Nursing Certificate in Emergency and Critical Care in March 2018. 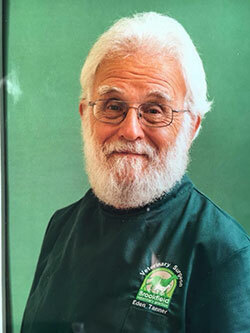 As well as getting stuck in with emergencies I spend a lot of time organising and running Puppy School at Brookfield Hereford and Ledbury and love meeting new owners with their puppies and am currently working towards my Nursing Certificate in Animal Behaviour. 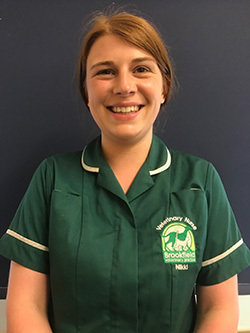 I was appointed Head Nurse in 2016 which involves working closely with the Vets and Nurses to help give our patients the best possible care while they stay with us. 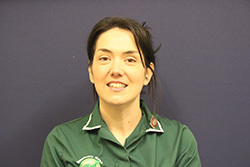 Trish undertook her Veterinary Nurse training at Brookfield starting 3rd April 1994 qualifying a couple of years later. In June 2016 she was awarded her Nursing Certificate in Animal Behaviour. And then went on to get her training qualifications. Trish is definitely an all rounder, using her years of experience in every area of the practice. Trish used to be a member of “Paws for Thought” dog display team but now co runs the Awesome Paws Performance dog training school when not at Brookfield and so can always offer some useful advice on dog training. She is also in charge of client accounts. Trish owns a family of miniature Schnauzers and has recently added a “Epic” her new cocker puppy to the crowd ! I qualified as Registered Veterinary Nurse in 2013 from Abbeydale Veterinary College. Previous to that I qualified as an Animal Nursing Assistant. I love all aspects of my job but particularly looking after inpatients, consulting and physiotherapy. I live with my husband, two young children and two German Shorthaired Pointers. Together we enjoy dog agility, Pembrokeshire coastal walks and in any spare time I have, horse riding. 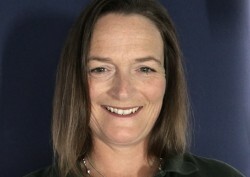 Mel joined the practice in October 2015. 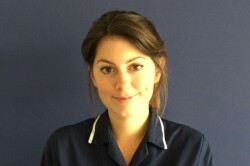 Mel was a fantastic locum nurse at Brookfield the previous summer so we were very happy that her name appeared on an application for a position. 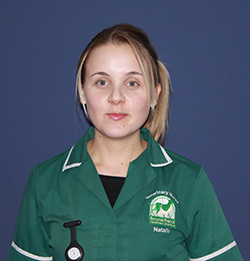 Mel qualified from a Veterinary Nursing Degree course in 2015. She particularly enjoys nurse clinics. Mel says she has been too busy for hobbies, but enjoys walking with her collie cross Lucy. I did my training here at Brookfield then qualified in 2008! I left for 2 years and worked in emergency clinics and various locum positions across the country to gain lots of experience! I returned to Brookfield in 2011 and after a couple of maternity leave stints I now work part time! I live with Archie the golden retriever, Dobbie the lurcher, Edward and Peggy the cats, Albert and Mavis the rabbits and I also own two small humans, Jack and Hattie! I love every single part of veterinary nursing but if I had to choose one favourite it would be nursing the geriatric dog! I'm also quite partial to taking any waifs and strays home. 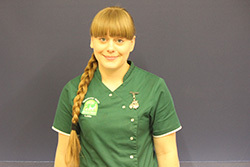 I am currently undergoing a BSC degree in Veterinary Nursing at the Royal Veterinary College - I have qualified as an RVN and am now doing my honours degree in the fourth year. I came to Brookfield as a work experience student and then carried out my placement blocks here also during my three years of study, and I am now located in the Ledbury branch, however you will still find me working one day a week in Hereford! Outside of work I thoroughly enjoy and pursue various fitness classes, cycling and supporting our striving local football team, Hereford FC. I also take part in pet sitting - unfortunately I don't have any pets of my own at the moment, so I can enjoy looking after others'! 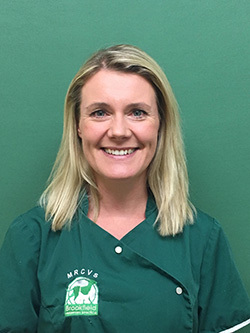 I started my veterinary career in a large mixed first opinion practice in Hampshire, where I qualified as a registered veterinary nurse (RVN) in 2010. In 2011, I joined a multidisciplinary referral centre as a general nurse before specialising in surgical nursing. In September 2014, I gained the Graduate Diploma in Professional and Clinical Veterinary Nursing. In 2015, I worked as a nurse manager at a large first opinion hospital organising the running of the day, training staff and additionally helped with the set up and running of the CT scanner. Alongside this role in 2015, I started working for a telemedicine company as a clinical case manager. I joined Brookfield part time in October 2016 alongside my telemedicine role. Brookfield enables me to get the hands on nursing that I trained for and enables me to put my many years of education and experience to use. I have many interests but to pick a few would be diagnostic imaging, surgical nursing and anaesthesia I have a cat called Welly who is amazing! 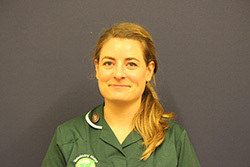 Rachel qualified as a Veterinary Nurse in 2010, she joined Brookfield in January 2017. She enjoys nurse clinics, especially weight management and dental home care consults. She also oversees all of our work experience students and has a keen interest in small furries and exotics. Rachel has five guinea pigs and a tortoise at home along with her 2 children. 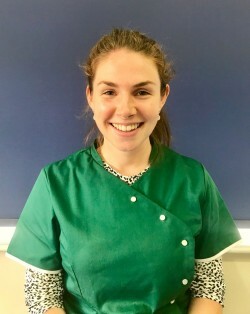 Rachel completed her Oral Care Nurse Certificate in 2018. Nikki came to Brookfield as a student for part of her Animal Management course. She then went on to study to become a Vet Nurse and has just qualified. Floss had experience as a receptionist in Swansea whilst studying at University. 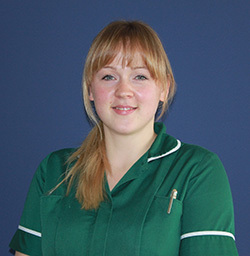 She joined Brookfield in June 2015 and is now in the second year of her veterinary nurse training. She has always wanted to work in Veterinary Practice. Floss has a cat named Ronald and labradoodle named Bonnie. 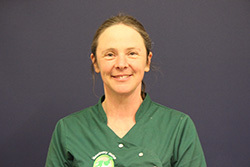 In 1996 I completed my Animal Care Level 1 & 2 at Holme Lacy College and it was at this time I did 6 months voluntary work at Brookfield, shortly afterwards I was employed at The Argus Veterinary Surgery in Ledbury, where I worked for the next 19 years! I have always loved animals & it is great to meet such a variety of different pets everyday & to be involved in their care. At home I have Kodi, a 5yr old Border Collie, Pinto, a 7yr old Australian Labradoodle, and 2 cats Bodi and Peaches. I currently work at the newly established Ledbury branch (formerly Argus) and have completed my Level 2 Certificate in Anaesthesia. Charmaine joined the team in May 2016 as part of her Business Administration Apprenticeship. After a few weeks she had fitted in so well with the Brookie team that we offered her a permanent position. She is a fond lover of cats, so when an 8 week old kitten came in needing a home, Charmaine was quick to snap her up, helping to hand-rear her back to full health. She and her partner have also rescued a Beagle X, called Tillie, from the Hereford & Worcester Animal Rescue. 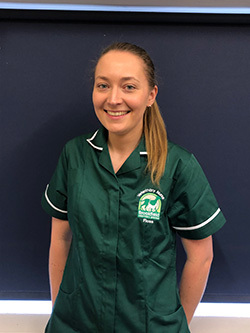 Charmaine has recently completed her ‘ISFM Cat Friendly Receptionist Course’ and is currently working towards her Gold Award within the British Veterinary Receptionist Association. Mary began working at Brookfield in 1993 as receptionist at the same time as Alison. Mary left us for a short while, but has now come back behind the reception desk, so many of our older clients will see a familiar face. Mary owns two little dogs Beazy and Molly. Georgia joined the Brookfield team in February 2017 as part of our reception team. 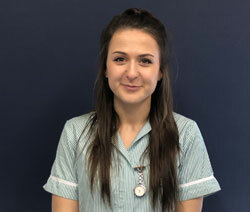 It was clear from the start that Georgia was keen to be more hands on with all cats and dogs alike, therefore Georgia is now attending Abbeydale Vetlink Training, working towards a Level 3 Diploma in Veterinary Nursing. Outside of work Georgia enjoys boxing, dancing and climbing, but most of all, spending time with her best buddy, Paddy. Georgia rescued Paddy from Hereford and Worcester Animal Rescue in 2017, it was an opportunity she couldn’t miss as ‘Sprockers’ have always had a place in her heart. 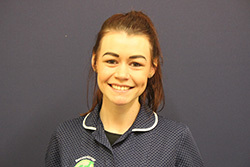 Maddy joined the team in March 2018, fitting in so well with her bubbly personality. 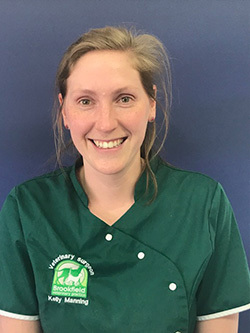 She has always worked within the pet industry, but her love for animals brought her to Brookfield where should could work closer with our four legged friends. Maddy has completed her ‘Cat Handling Course’ which helped contribute to our achievement of becoming a Gold Cat Friendly Practice. 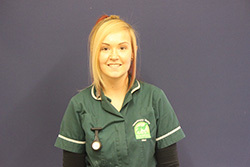 She is also working towards her Gold Award within the British Veterinary Receptionist Association. At home, Maddy is kept busy with her 4 dogs; Bean, Bruce, Jess and Nelly. She enjoys taking them all out on a woodland walk amongst the Forest of Dean, along with her husband and daughter, Lexi.